Costas Inn has its own take on seasoning for steamed crabs: they don't just throw a bunch of Old Bay and black pepper on them. It has a distinct sweetness to it – perhaps some toasted onion in there. It's beloved by celebrities and food authors, including David Rosengarten and the folks on the Today show. 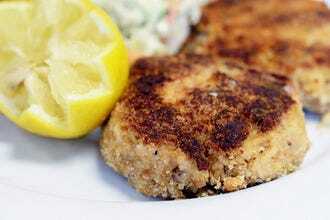 They offer their crab cakes broiled or fried, but lots of people prefer broiled, especially for their 1/2 lb. size. Broiling makes a nice crust outside. They also offer a dish with two 5 oz cakes. The cakes have lots of jumbo lump, with a little breading to bind them. They're very flavorful, with their own special seasoning creating a bit of heat. Their Sandwich Chesapeake has a broiled crab cake and their creamy fresh shrimp salad on toasted 12-grain bread. Crab Cakes: "You should make reservations for this popular place on game days and to reserve steamed crabs ahead of time for your table." Seafood: "You should make reservations for this popular place on game days and to reserve crabs ahead of time for your table." Best Restaurants: "Costas Inn ships nationwide, so send a taste of Baltimore to your friends." Best for Crab Cakes Because: This is a great, reasonably priced, relaxed place. The dining room is family oriented (with a big screen tv) and the bar is a party. Best for Seafood Because: For that Baltimore meal that used to be part of everyone's backyard experience – steamed crabs opened with a mallet – this is the place. Recommended as Best Restaurants Because: You gotta try crabs in Baltimore! But so many places are tourist traps. Costas Inn is a family-owned, neighborhood place that's world-famous for its quality. Topped with Amaretto creamed spinach and melted provolone cheese. Chef's special recipe! Fresh leaf lettuce with Feta, kalamata olives, pepperoncini, cucumbers, tomato & onion. Fresh leaf lettuce topped with julienne ham, turkey, American and Swiss cheese. Choice of alfredo, marinara or scampi sauce.